Players race to empty their hands and catch opposing players with cards left in theirs, which score points. In turns, players attempt to play a card by matching its color, number, or word to the topmost card on the discard pile. If unable to play, players draw a card from the draw pile, and if still unable to play, they pass their turn. Wild and special cards spice things up a bit. 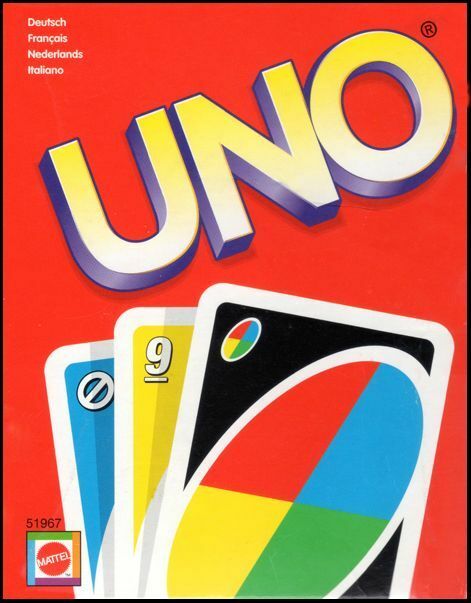 UNO is a commercial version of Crazy Eights, a public domain card game played with a standard deck of playing cards. This entry includes all themed versions of UNO that do not include new cards.